I jetted down the coast to the Bay area for a short but sweet Thanksgiving trip to see some family. I wasn't planning to make the trip about sewing, but Leslie forwarded me a 20% off coupon from Stonemountain & Daughter and my arm was twisted. I recruited my SIL to come too, so that still counts as family time, right? Leslie in her Patrones skirt and me in my BWOF dress. As it was my duty to support the economy on Black Friday, I didn't leave empty-handed. I got this B&W wool coating, and a colorful silk lawn that will make a great summery blouse. I also picked up this Olfa rotary cutter extension guide, it makes it easy to add SAs during cutting - very handy for BWOF addicts. Rumor is that it is no longer being produced, and I'm pretty sure I bought the last one in the store, the salesperson gave me the display package because she couldn't find any more stored away. It doesn't work with the ergonomic style Olfa that I have, just the original straight-handled models, so it looks like now I need to buy a new rotary cutter in order to use this! After I parted ways with Leslie, my SIL and I met up with our husbands and we toured the Yves St Laurent exhibit at the de Young Museum. Talk about inspiration! The garments are definitely more incredible in person than they appear in photos. The exhibit is open until April 4, 2009. What a wonderful way to spend Black Friday! 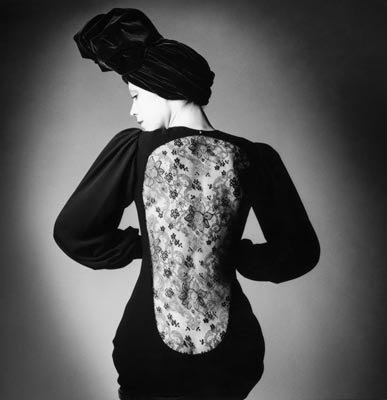 I hope that YSL exhibit comes east. I remember when that picture of Catherine Deneuve first came out. I was captivated by that dress then and I still am! Cool! I love seeing photos of when online sewing sisters meet in person. What a fruitful trip! Love your fabric choices and it's always nice to spend time with a sewing sister...jealous, jealous, jealous about the Yves St. Laurent exhibit! Great fabric! I wonder if that show will be coming to NYC? Not having a great fabric store close by, I did my duty to the economy with a sale purchase at Emmaonesock. Fabulous fabric! I would love to see that exhibit! You're so lucky! YSL is awesome! Lucky you! Ooh I just love that YSL dress, I want to see that exhibition too!